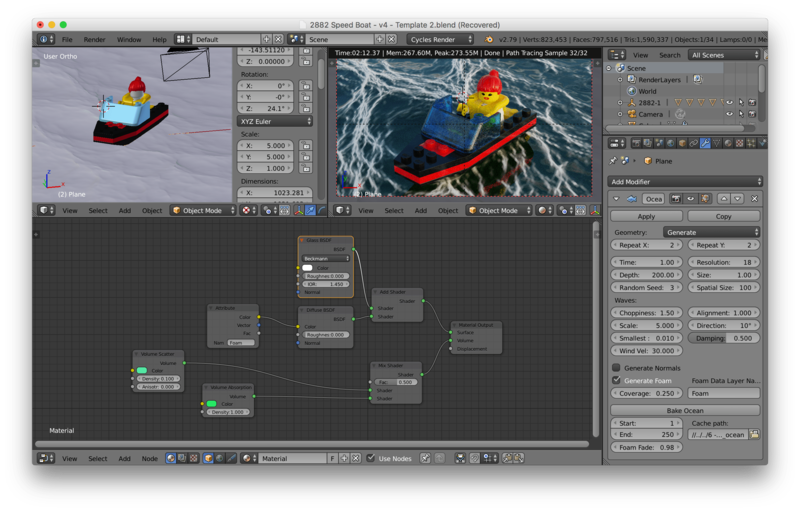 Playing around with water again in Blender, using the promotional Speedboat I built in Mecabricks. I generated water in a previous model, but I wasnt overly happy with it. It was a bit too smoothmore like bath water. So, I tried again with a different LEGO model. And, this time Im pleased with the results. 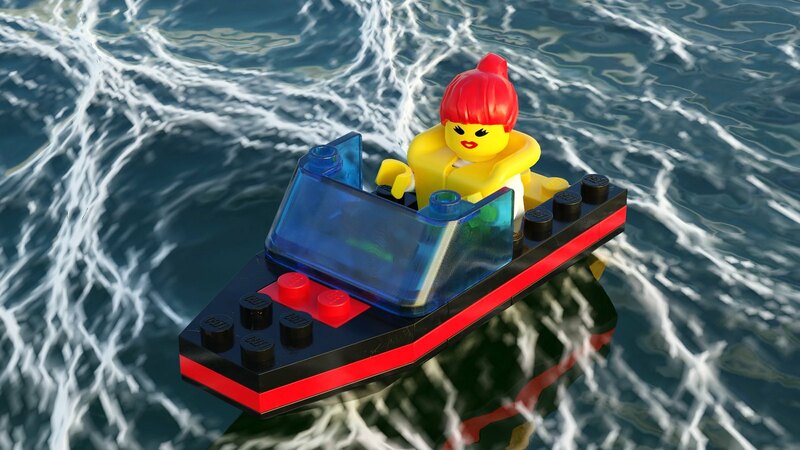 When I came across LEGO set 2882 Speedboat, a promotional set from 1997, I thought it would make a good render. Although still a twenty year old set, almost all the parts were available in Mecabricks. That made the build easier, and I quickly had my subject. The next step was to build a water scene. Sure, I knew how I built my last model using water, but I wanted more. As before, I started with a mesh plane and added the Ocean modifier to it. I tweaked the option, but things werent looking any better. So, I dug around and found a good tutorial to Create Realistic Oceans. Although for an older version of Blender, it still applied to 1.79. At this point, I started over, using the base options from the tutorial as a start. Okay, things were looking better. I then adjusted and tweaked until the speedboat looked nice in the water. There was still some trial and error in the settings, but the waves looked good. I decided to use the more interesting material node tree from the tutorial, but with my own colors. Things looked good, but the water was too clean. Still using the tutorial, I added in some foam, which required some tweaking to remove any artifacts. Once done, I rendered the image. And, I noticed some more artifacts, as well as a few mistakes in my model. Darn it. Back to work, tweaking a few more options. I adjusted the arm position to remove an intersecting piece. I also added some subdivision modifiers to the bricks to round out parts. This cleaned up the image, given how close up it was, and I rendered it again. The final image looked pretty good. But, the foam still looked off. I ended up shifting the ocean plane around a bit to reduce the artifacts even more. Everything still looked nice. Now for the final render, resulting in the image above. For posterity, here is the node tree that I used to generate the water. I should also note that there is a plane with a pebbles texture underneath the water. But, the light didnt penetrate enough to expose it. Id still like to generate a clearer version that shows off the ocean bottom. Dont be surprised if I post a third attempt in the future.